Flash back to the fall of 2005. I was sitting in the computer lab one afternoon working on a project with some other teachers. There was a CD on and it really caught my attention. I asked what it was and was told it was Michael Bublé. As the mother of a then two year old, I was quite out of the adult music loop. All I knew was that the songs were wonderful, Bublé’s voice calming, and I was in love with everything about it. I talked about it so much that my husband bought me the It’s Time CD for my birthday. I would often sit there listening to it over and over as I wrote lesson plans. My favorite song was Home which brought chills down my spine. 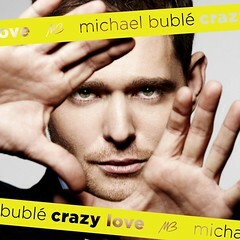 Recently, I was asked by One2One Network to review a copy of Michael Bublé’s new CD Crazy Love. I immediately jumped at the opportunity. The CD arrived just before the release date October 9. I immediately opened the box and popped it into my laptop to listen to. Within seconds, I was transported. I was singing away to the music along with Michael Bublé. For a short time, I was able to escape from the reality and stresses of life. I truly believe that Michael Bublé could be the new Frank Sinatra. His sweet voice just soothes you as you listen to him belt out song after song. His style transforms classic covers from other artists into his own genuine versions. The CD begins with "Cry Me A River" where you could almost imagine the entire orchestra playing behind Michael Bublé. The instrumentals are powerful and Bublé’s voice keeps up with each and every beat. The classic "Georgia On My Mind" has a new twist thanks to Michael Bublé. As beautiful as the song was when sung by Ray Charles and countless others, it has a new presence thanks to Bublé and the subtle tempo changes. Another favorite of mine is the title track "Crazy Love" which was originally performed by Van Morrison. This song immediately made me recall the movie She’s Having a Baby where the song was featured, along with General Hospital. Even my boys liked this song and came to dance along with it. The first original single from this album released is "Haven’t Met You Yet" which really shows the artistry of Michael Bublé. Here is the video of this song for you to see. Sit back, relax and enjoy watching Bublé and his amazing talent. I know that I will continue to enjoy Crazy Love and other music from Michael Bublé as he continues on his successful singing career. These classic songs will play while I work on writing, reading and knitting because they help me to stay focused and relaxed. Crazy Love is now available to purchase where all CDs are sold. Of course, if you are a fan and on Facebook head over to the Michael Bublé fan page. Thank you again to One2One Network for providing me with the opportunity to review this fabulous new CD. Disclosure: I received a free copy of the CD to do this review with no other compensation. The opinions expressed in the review are my own.